A day on the farm is a day of discovery and fun. 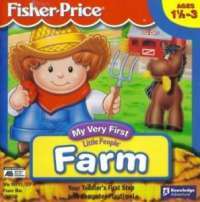 Little farmers will delight in exploring the barn, feeding the animals and growing crops. Sweet songs, playful activities and special surprises make this a place your favorite farmhand will want to visit again and again. This is an interactive playground designed just for toddlers. There are plenty of big jobs to be done on Discovery Farm, and Farmer Jed could really use your toddler's help. Little ones will delight in interacting with Farmer Jed and the Little People farm animals in a farm full of fun activities. Each activity is carefully planned to stimulate a toddler's natural curiosity and encourage learning through play and exploration. It's big fun for your little one.